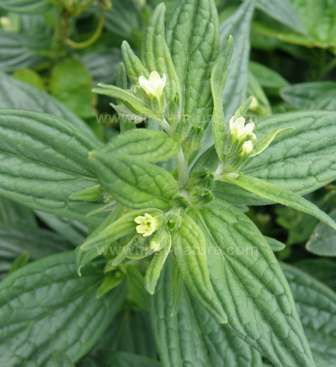 A hairy branching perennial, Common Gromwell grows to a height of 1m. Its greenish cream flowers are typically 5cm across and have five petals. The broadly lanceolate leaves, up to 7cm long, have deeply indented radial veins and numerous lateral veins. Not as common as its name suggests, Common Gromwell occurs in southern parts of England, Wales and Ireland and is absent or scarce elsewhere in Britain. This wildflower is native to Europe and eastern Asia; it has been introduced to other regions including North America. Common Gromwell grows on calcareous soils beside hedges, along the edges of woodlands and in rocky scrubland. The flowers appear during June and July. The specimen shown on this page was found in the Anglesey Fens National Nature Reserves in North Wales and was photographed in mid June.